You could call it a prank of presidential proportions. 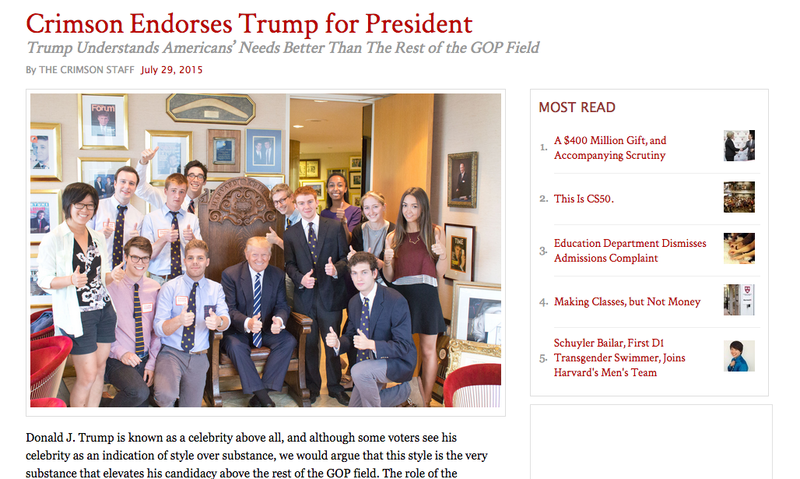 Portraying themselves as their longtime rivals, Harvard Lampoon staffers tricked the Donald J. Trump campaign into thinking that The Crimson was endorsing the controversial candidate in his bid for the American presidency. It all started earlier this summer, when the prized Crimson president’s chair went missing from the newspaper’s Cambridge, Mass., headquarters. Harvard lore dictates that staffers of the Lampoon—a semi-secret Sorrento Square social organization that used to occasionally publish a so-called humor magazine—try to steal the chair, while Crimson editors seek to nab the large metal bird, called the Ibis or Thresky, that sits atop the roof of the humor publication’s property on Bow Street. In late June, Crimson summer staffers returned to the newspaper building to find their storied chair missing from its second-story perch, according to Crimson president Steven S. Lee ’16. A casing for bolt cutters lay nearby; the chair had been chained to a wall to prevent it from being stolen. Lee immediately suspected that ’Poonsters were behind the theft and contacted them to request that they return the chair. "They said they would get back to me on it,” Lee says. A few weeks later, the chair made a very public appearance. An article, emblazoned with the headline “Crimson Endorses Trump for President” and signed “The Crimson Staff,” cropped up online, claiming to tout the newspaper’s support for the billionaire Republican primary candidate’s bid for the presidency in 2016. Among other points, it dubbed him “a celebrity above all” and “the most formidable and competitive candidate on the Republican side.” It also espoused his job creation record—specifically the supposed good work of “The Celebrity Apprentice,” a reality show Trump has hosted. The editorial reasoned that the show helped “inactive or troubled” celebrities regain their fame and thus created jobs. "The creative methods and avenues through which Trump has created jobs would likely make (former Crimson editor-in-chief) Franklin D. Roosevelt ’03 smile,” the editorial read. A photo of a grinning Trump, seated in The Crimson’s stately president’s chair and posing with two thumbs up, accompanied the article. In the photo, he is surrounded by a group of college-aged people, some dressed in matching ties, who a reader might presume are members of The Crimson’s editorial board. 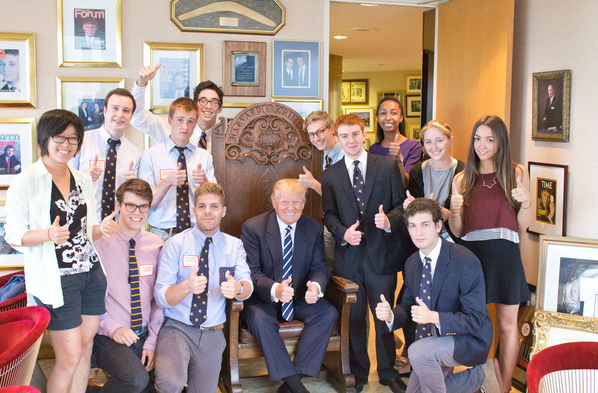 A screenshot of a photo taken of presidential candidate Donald J. Trump alongside... not The Crimson's editorial board. It’s quite a photo. Trump’s hair is perfectly coiffed. At least some Lampoon staffers, it appears, orchestrated the photo-op. Masquerading as The Crimson, some pranksters apparently informed Trump campaign officials that they planned to pen an editorial endorsing the business magnate-turned-Republican primary frontrunner on behalf of the paper, according to Lee. While the Crimson president didn’t go so far as to outright accuse the Lampoon of the prank in an interview, he could identify some of the people in the photo as ’Poonsters, a fact Flyby independently verified. It looks like they transported The Crimson’s chair to Trump Tower in New York City and posed with the candidate, successful in their quest to dupe him and prank their rivals. The Crimson, for its part, was unaware of the plot until a Trump campaign representative contacted Lee about the editorial, which the imposters had apparently sent to the campaign pre-publication. Unfamiliar with the article, Lee realized that some individuals were likely posing as Crimson editors. He clarified to the campaign that no one had visited Trump Tower on behalf of the newspaper, nor authorized the editorial. “They recognized the situation once we had chatted, and it seemed like they were going to take care of it, whatever that means,” Lee says. The parody editorial went up online briefly in mid-July and then again a few days ago. The Trump campaign declined to comment on-the-record for this post. But despite its glowing endorsement of the candidate, the parody article was not featured in the “In the News” section of the campaign’s website at the time of this post’s publication. Lampoon president Calvin Willett ’16 did not respond to multiple requests for comment.